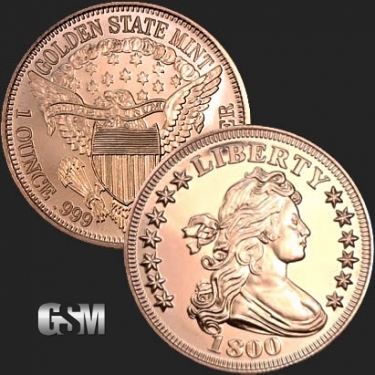 Manufactured in the United States, by Golden State Mint, the 1 oz Bust Copper Round is comprised of .999 fine copper bullion. On the front, the coin bears Robert Scott's famous Draped Bust, which shows the profile of a woman with free-flowing locks situated beneath the embossed word "Liberty." On the reverse, the coin bears the Great Seal of the United States, which shows the bald eagle with spread wings while its talons clutch both an olive branch and a bundle of arrows. 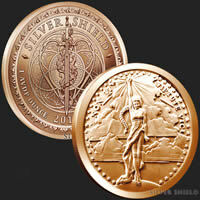 Each coin is made using 1 full Avoirdupois ounce of .999 copper, ensuring the highest quality possible. If you liked this product, you should check out our 1 oz Copper Pope Francis, 1/2 oz Copper Saint Gaudens, and 1/2 oz Copper Walking Liberty.